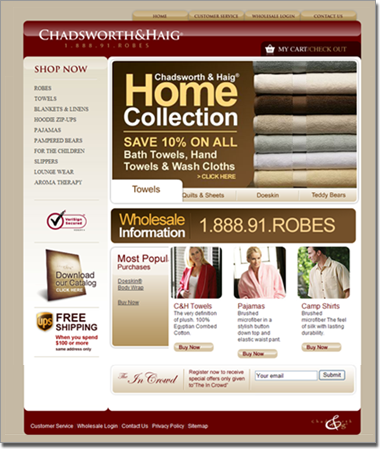 Chadsworth & Haig is one of the leaders in robe fabrication in the United States. They service many of the major hotels in Las Vegas. Chadsworth & Haig came to Lurus in order to expand their services to include online sales. Lurus developed a modern look and feel which would highlight their products. In addition, we developed a fully customized shopping cart tailored to their specific needs. This shopping cart includes inventory management, shipping modules, and the ability to track all of their online orders. Chadsworth & Haig quickly saw an opportunity to expand their online sales to begin selling items as wholesale to individuals within their major clients. Lurus created a wholesale area which enabled Chadsworth & Haig to discount products based on a visitors company. Many of the major clients, such as New York - New York in Las Vegas, wanted to give their staff a chance to purchase the robes online at a discounted price. This new wholesale system helped significantly expand their sales volume.